Councils have been urged by Eric Pickles not to give special tax breaks to the Church of Scientology. The communities secretary said he did not believe most voters would want their councils to give favoured tax treatment to the organisation. 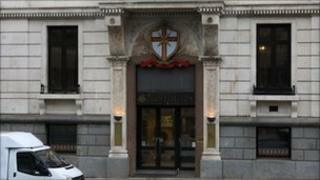 The BBC's Panorama has said Westminster City Council gave the church 80% rates relief on its London Celebrity Centre. The Church of Scientology says local council authorities have "recognised the religious nature of Scientology". The Guardian says the City of London, Birmingham and Sunderland have also given rate or tax relief to the church in connection with buildings in their areas. Westminster City Council classes the Church as a "non-registered charity" as it is "beneficial to the community," and gave it rate relief that saved the church £165,303 over the past 10 years. Mr Pickles said: "Tolerance and freedom of expression are important British values, but this does not mean that the likes of Church of Scientology deserve favoured tax treatment over and above other business premises. A Church of Scientology spokesman told the Guardian: "Scientology is very popular with those who have visited our churches, met with Scientologists and observed or utilised our numerous community activities that effectively address drug abuse, illiteracy, declining moral values, human rights violations, criminality and more. "Local council authorities, government bodies in this country and many others, and the European Court of Human Rights have all recognised the religious nature of Scientology, or the fact that Scientologists are actively helping those in their communities as a direct reflection of their religious beliefs."